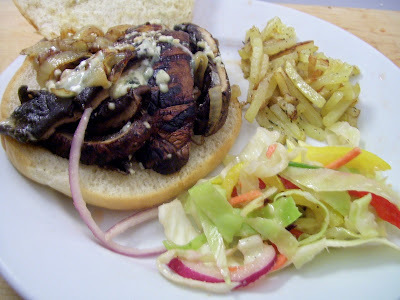 JUST VEGGING OUT: Recipe: Grilled Portobello Mushroom "Burgers"
After the wonderful food and wine I had on Saturday night for my 40th birthday at a restaurant called Rock Creek in Bethesda, Maryland, I was set on having something simple for dinner last night. I don't know why, but last night I was craving a portobello mushroom "burger" with lots of onions, and fries on the side. I recalled last year making Ina Garten's matchstick fries from an episode of "The Barefoot Contessa" on Food Network. Last night, I made matchstick fries again. But rather than sprinkling them with salt and chopped parsley, as called for in the BC's recipe, I sprinkled them lightly with salt and Herbs de Provence. I cooked the fries as I was sauteing the onions (until soft and dark brown in color), and kept the cooked fries warm on a baking sheet in a 350 degree oven until dinner was ready to be served. I grilled the marinated portobello mushroom caps for about 3-5 minutes on each side until they were soft. After I removed the caps from the grill, I cut them into 1/4 inch slices. I placed a generous heaping of onion slices on a kaiser roll. I topped the onion slices with several slices of mushroom and crumbled blue cheese. It so hit the spot! Marinade for Grilled Portobello Mushroom "Burgers"
Mix the balsamic vinegar, water, olive oil, garlic, and salt in a small bowl and pour into a large freezer bag. Add the mushroom caps (stems removed), seal the bag, and marinate for about 1 hour. Shake the bag after about 30 minutes to make sure all the mushroom caps are coated with the marinade. The mushroom caps will cook quickly on the grill - about 3-5 minutes on each side. So, begin grilling them approximately 10 minutes before the meal is ready to be served.